So, the big trip to Yosemite is upon us! First the road trip itself. It takes about 8 hours to drive to the park, so we got an early start and left at 6 am. That was perfect for our early risers! They were so excited to go, they all woke happy and ready to hit the road. We watched stark, desert landscape like this for many hours. Not my favorite views, but give me some good traveling tunes, great conversation with my man, and I love a road trip of any kind. 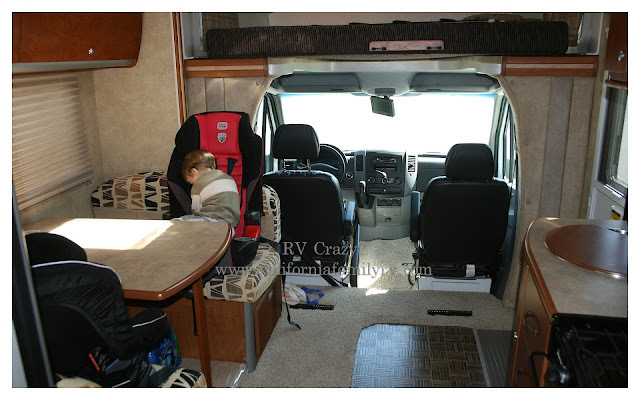 The kids were thrilled to ride in back and color or watch movies. They also played a lot of alphabet bingo as we drove. They did really, really well on the drive. 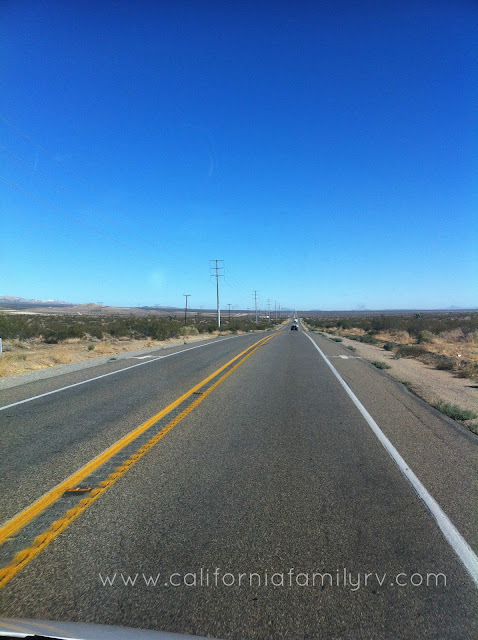 Before too long, the blah boring road morphed into an interesting foray into tiny towns and small farming communities. It was fun to see the junkyards, neighborhoods, country schools, and classic cars peppered throughout our drive. One of my favorite things about road trips is getting a firsthand glance into other people's worlds and imagining what it must be like to live in their space. 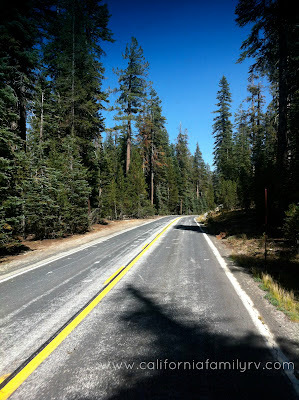 Soon, we began to see pine trees, and lush landscape as we entered into Yosemite National Park. Finally, we made it to our camping spot! We were camping in North Pines Campground. Having visited Yosemite before, we were prepared for cramped, crowded conditions. My skilled hubby pulled our little rv right into the spot. Definitely a tight squeeze, but that's why we got a small rv! It was a small spot (as expected), but we don't need too much space. 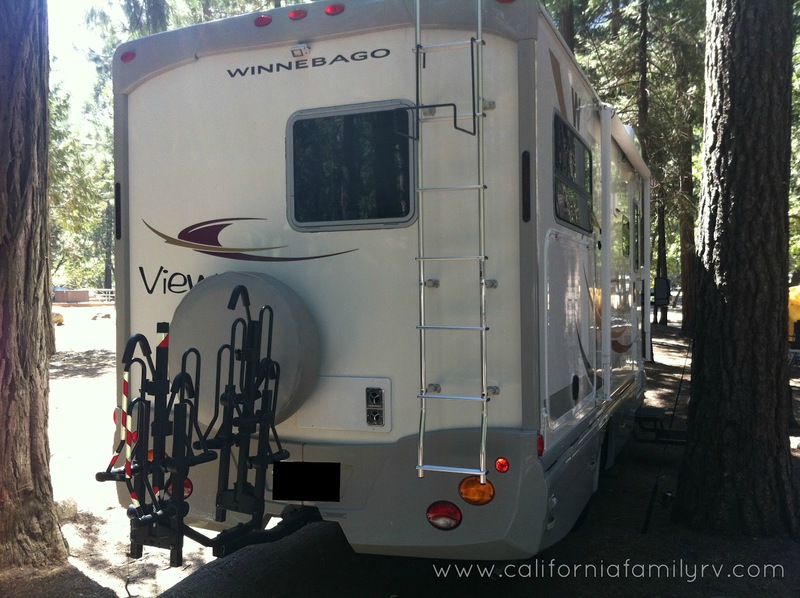 There were some huge rv's in the park, but they were in larger spaces which fully accommodated them. Given all of the publicity about how prevalent bears are in this area, we were all surprised to see so many tent campers. In fact, they were the vast majority of the campground when we arrived. There were bear lockers, fire rings and picnic tables at every site here. We were in site 115 in North Pines. The campground was pretty full, but the park was not nearly as crowded as our previous visits. We were both amazed at how empty the place was. Perhaps the hantavirus scared some visitors away? First order of business (with our kids) was to make dinner. I had prepared chili at home the previous week, which was thawing in our fridge during the drive. I try to do a lot of shortcuts like that prior to the trip, to make for an easier and more enjoyable vacation for ALL of us! :) So, my hubby took our oldest daughter for a short bike ride, while the younger kids and I warmed up our dinner. They returned, moments later, very excited about seeing a deer right in our campground! R was chattering, and chattering, jumping up and down, and insisted I watch the video her dad took of her with the deer. She was so cute, and so excited, and insisted that I run over with her and try to find the deer again. So we jumped on the scooters (ps- I stink at scootering) and raced to find it. When we arrived, the deer was gone, so we returned to camp. My hubby was stirring dinner outside, while shooing persistent bees away. I went to sit in my chair, without realizing an angry bee/wasp that he had just smacked with a spoon, was already sitting there. OUCH!!! Right in the keister! My first bee sting. And it HURT!! I was torn between ripping my shorts off in full view of the campground and screaming like a lunatic, and being a responsible, cool-headed mom and pretending this burning fire on the right side of my rear didn't hurt like a stabbing knife. I settled for grabbing my husband, dragging him into the rv, and hushed-ly whisper-yelling to him to please pull the stinger out of my @r$# while wrenching my own shorts off. It was not one of my finest moments. After a shorts-change, and insuring the stinger was gone, I was good to go. I had to act tough because my older girls had both been stung by bees earlier in the summer, and they were very cool about it. I was doubly impressed after this. So, with wine and a campfire, and a burning sensation in my right cheek, our first day in Yosemite came to an end. It was a full day, and one I won't soon forget! Oh SS I can totally see you ripping your shorts- flipping-- I mean really calmly having the hubs pull the stinger... thank god for wine.